Join the Heroic Yacht Club for all-ages aquatic avengers! 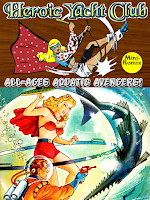 Golden Age heroes sail the 7 Seas and the stars for amazing adventures! Starring Polka-Dot Pirate, Mark Montage, the Corsair Queen, Spacehawk, Captain Cutlass, The Hawk, Reef Ryan, Space Pirate Tara, plus Catman and Kit! 100 Big Pages of fantastic voyages above and below the water! You can download this now at Drive Thru Comics, plus download and print at Indy Planet. Golden Agers dances into some Terrific Tidbits! This FREE comic is filled with fun comic shorts for fans of all genres. Alien Bugs rock rockets, criminals commit comedic capers, learn about Our Amazing Universe, dip into Dazey's Diary, Flukey Luke fixes his tub, Weird Worlds sees spastic space, Benny the Bug bugs a dog, take a trip to Monsterville, sitcom silliness with Lolly and Pepper, wander with Wilber the Worm, catch Carl 'n Cal, meet Mitzi the Moth, Little Jack Frost makes snow, tail Tabs the Cat, Beanie the Meanie causes trouble, Pilot Pete takes off, The Toodles keep it together, Timmy the Timid Ghost gets a parrot, Lil' Genius uses his smarts, plus Atomic Mouse and Atom The Cat! 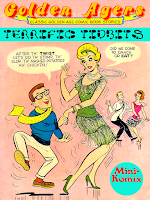 You can download this now from Drive Thru Comics, plus as part of the Golden Agers: Humor Collection Bundle. Klassik Komix clips together the Cliffhanger Chronicles! Firehair of the Sagebrush Frontier protects her tribe, Moon Girl fights crime, Dagar the Desert Hawk messes with a mummy, Wilfire assaults arson, Red Torpedo meets the Mermazons, Herucles attacks the Amazon, The Black Terror saves the circus, Blue Bolt greets the Green Sorceress, Tygra journeys to a lost world, Fatman flies into action, and Mysta of the Moon bashes The Brain! 100 Big Pages, and in color! This is now available at Lulu. Krossover Komiks collects the most terrific team-ups from the Golden Age! 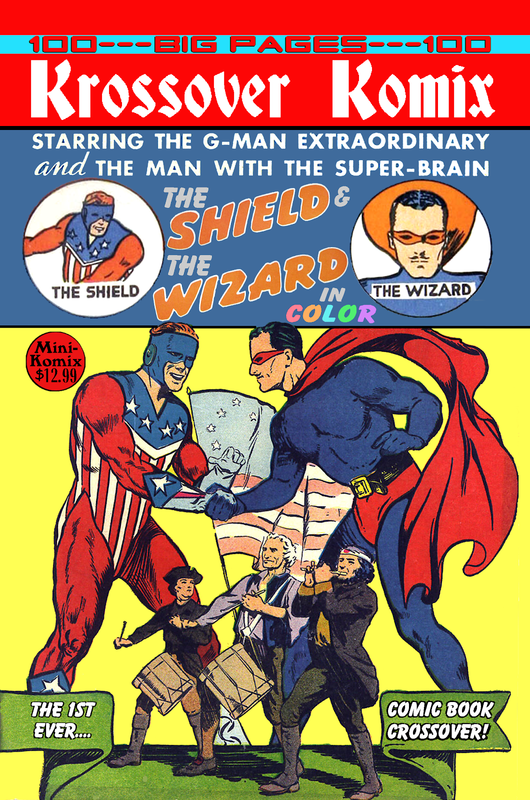 The Wizard and The Shield unite in the first crossover in the history of comics, Dollman dates Dollgirl, Mickey and The Kitten form the Little Leaders, and Bulletman meets Captain Marvel Jr.! 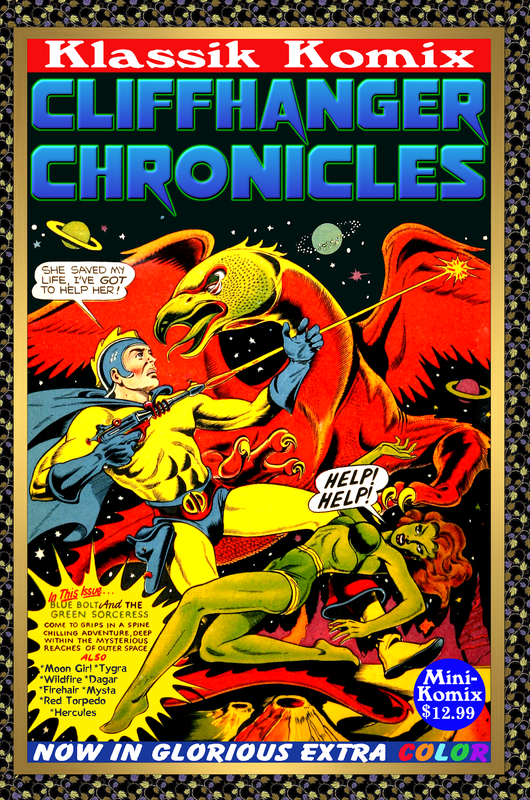 Cosmic crossovers of heroes of yesterday and legends of tomorrow! 100 Big Pages, and in color! You can get this now at Lulu. 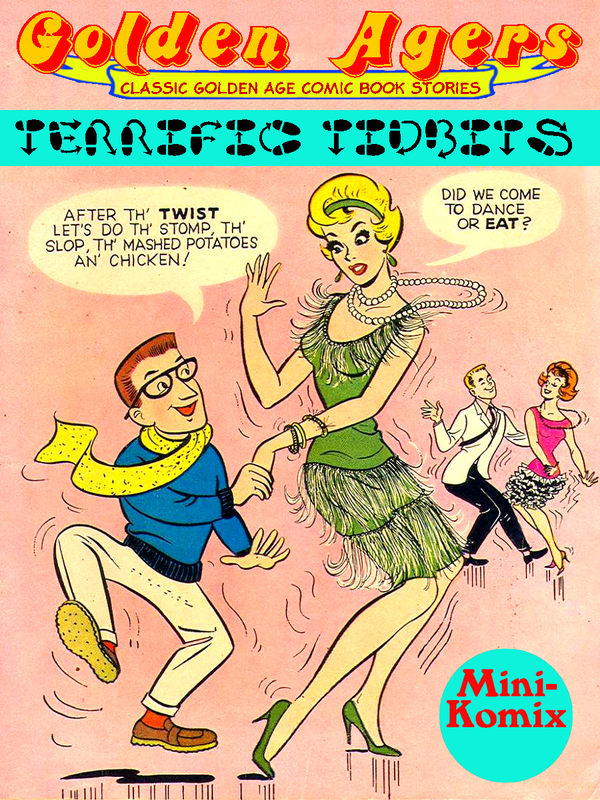 Daring Dames heads down the halls of The Hotties Of Harvey! Two superheroines from Harvey Comics in a collection of some of their best comic and prose stories! Linda Turner is Hollywood's darling who leads a double life as the masked marvel, Black Cat! Also, Pat Parker is a British nurse during WWII who secretly becomes War Nurse, and later forms her own all-girl team, the Girl Commandos! Featuring guest appearances from other Harvey Comics heroes: Captain Freedom, Shock Gibson, and the Spirit of '76! 100 Big Pages...and in color! You can get this paperback now at Lulu.